Boaters love being out on the water and exploring new places. Whether that’s on a yacht or a small canoe, all boaters share the love for being out on the open waters. 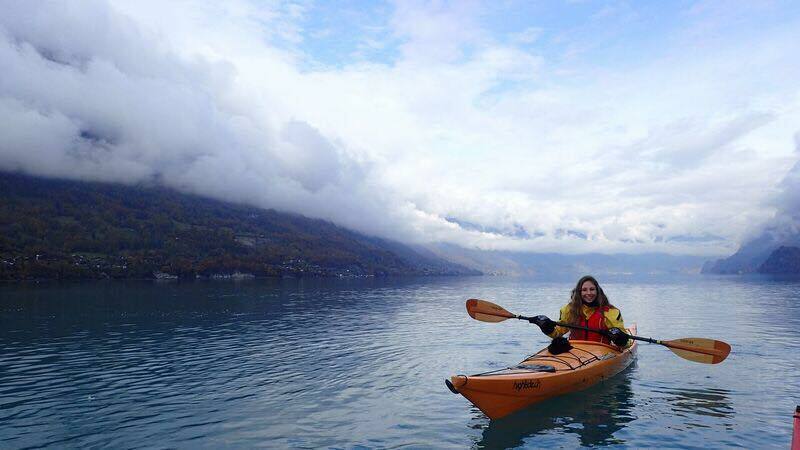 Snag-A-Slip Intern Gracie got an experience of a lifetime while kayaking in Interlaken, Switzerland during her study abroad semester. 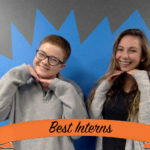 Studying abroad is an experience of a lifetime as a whole, but each individual aspect offers something new and exciting. Although I was based in Florence, Italy, Switzerland was a must-see during my time abroad. Initially I had full intentions of trying to ski or snowboard while in Interlaken, Switzerland but there wasn’t any snow. My second to last trip while studying abroad was to Switzerland. With the ski slopes still closed, I wanted to find a different activity to take up some time during the weekend. Switzerland is known to thrill seekers as the adventure capital, offering activities such as paragliding, hang gliding, and skydiving. Of course, I am terrified of heights, so none of this appealed to me. 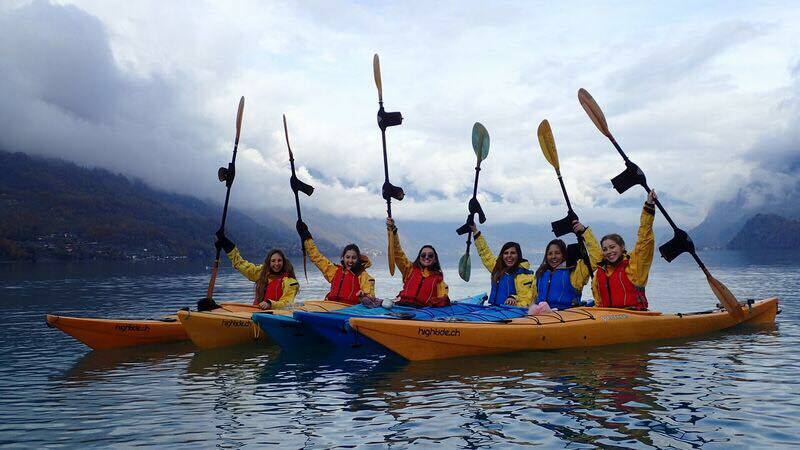 However, the group I was traveling with offered winter kayaking on Lake Brien, which is the heart of Interlaken. I love working for a boating company, however my boating experience is minimal. 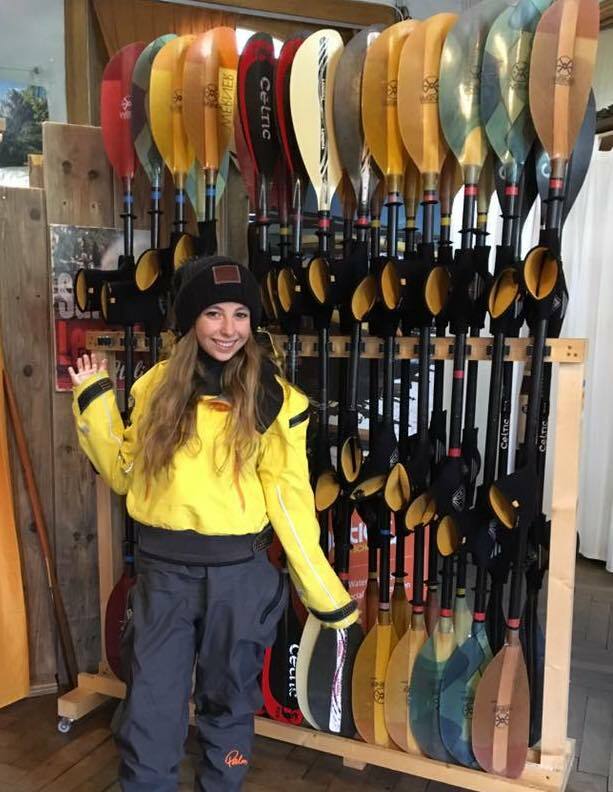 I never really had interest in canoeing or kayaking growing up but I knew this would be a once in the life experience. I signed up and was looking forward to this new adventure. Our group arrived to the lake ready to go with lots of enthusiasm. First things first, we needed to be fitted for our dry suits. They were huge, warm, yellow suits to keep us dry and warm out on the lake. With our suits on and paddles passed out we were ready to go! No one in my group had ever kayaked before. We all stayed together with one of the guides, paddling around and learning some of the history about the lake and town of Interlaken. The view on the lake was breathtaking to say the least. It looked like something out of a movie scene but even more magical. We were lucky enough that the sun came out right as we got out onto the lake. The water was a beautiful thick blue. It reminded me of the blue gatorade drink. Surrounding the lake were mountains with the leaves changing colors and small houses. It was absolutely beautiful! As I looked out towards the other end of the lake, it looked as though the clouds were just floating above the water. We were able to spend roughly two hours out on the lake. Our guides took us to the most beautiful spots along the lake. Even during our break, the guides continued to show us incredible views by taking us up to the top of a castle. No matter where we were on the lake, the scenery was stunning. I am so grateful I decided to step out of my comfort zone that day. There is nothing that will ever compare to this experience. Sometimes, it’s worth getting out of your comfort zone and see what comes of it. We’d love to hear about your favorite adventures! Comment on our Facebook and Instagram pages to tell us some of your best boating experiences.